Hotel Kilkenny, Monart Destination Spa and Ferrycarrig Hotel make up an iconic Irish business success story. Together, they have been welcoming corporate and private guests from around the world for almost 90 years. For a business that prides itself on the efficiency of its operations and its dedication to delivering the ultimate customer experience, a tediously slow and unreliable internet connection was a real frustration. It was slowing down staff, disrupting internal communications and was a glitch in an otherwise faultless customer service performance. The beautiful, rural south east Ireland landscape that is home to the Griffin Group was both its crowning glory and its Achilles Heel, with conventional technology struggling with the geography. 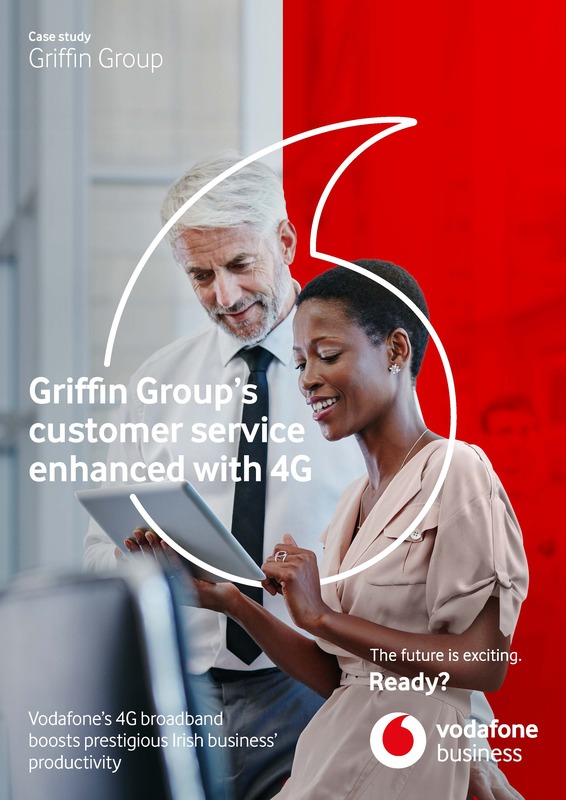 But a strong, long-standing relationship with Vodafone, meant that the Griffin Group was quickly able to find a solution to help it become a ‘Ready Business’. The award-winning Griffin Group is one of Ireland’s most successful and prestigious hospitality businesses. It has established an international reputation for excellence, with Monart Destination Spa recently voted one of the top two spa retreats in the world by readers of Condé Nast Traveller. With decades of experience in the hotel and tourism sector, the group also delivers consultancy services in finance, operations, sales and marketing. Still a family business after almost 90 years, the group is headed by Liam Griffin, one of Ireland’s leading entrepreneurs and motivational speakers – and a sporting icon to boot, having managed Wexford to All-Ireland hurling success in 1996. With its reputation for quality established, the group strives to ensure that all aspects of its guests’ time with them are successful and enjoyable. However, one recurring challenge for the three properties, partly a function of their rural locations, was a slow and unreliable internet connection. This was a problem not only affecting the efficient operation of the business, but also visitors too. For managers and staff, communication between locations was sometimes difficult and intermittent, and download speeds were so slow that employees typically spent up two hours each day waiting to receive emails and documents. For guests it was often difficult for them to access the internet using their devices, while the problem regularly impacted on corporate customers too with those attending conferences and business meetings struggling with connectivity and download speeds. With a partnership stretching back more than a decade for the provision of mobile phones, Vodafone and Griffin Group regularly discuss service enhancements and new products that could benefit the business and its customers, as General Manager, David Byrne, explains. “When our Vodafone Business Manager informed me that we were now in a position to take superfast 4G broadband, we knew that this was just what we needed to resolve some significant operational difficulties and greatly enhance services for customers. “So, we jumped at the opportunity and Vodafone came up with a very attractive, tailored package for us.” In addition to iPhone 5S mobile devices with 4G for staff, supported by comprehensive connectivity, Vodafone also provided fast and reliable server cloud connections and backups for the group’s SQL and working servers. The three hotels’ networked central servers were also provided with a 4G backup, enabling speeds and data relays as fast and reliable as a local area network. “Another big plus is that the implementation of 4G is so simple. It was seamless, with no service interruption, disruption or downtime – it’s instantaneous – and so are the benefits.” For David and his teams there were immediate improvements in productivity, with fast download speeds delivering emails and documents to their mobiles and workstations within seconds, enabling daily tasks to be completed much more quickly and efficiently than before. “At a basic, day-to-day level, our ability to get things done was transformed – it makes us quicker, more efficient and it’s great to concentrate on providing a great service for customers rather than worrying about our technology. “General communications between our three locations, between managers and staff, is vastly improved and we are able to begin making use of options like mobile conferencing to hold meetings and make decisions. Managers are also able to monitor productivity and customer service levels by viewing the hotels’ security system cameras in real-time on their mobile phones, assessing staffing levels or customer requirements, and giving instructions to staff members to go to their assistance. “4G is great for our customers – which is great for our business of course,” says David. “For example, at Hotel Kilkenny where we hold our conferences, it’s essential that we have fast, reliable broadband for businesspeople to make presentations, stream video and so on, which we have complemented with Vodafone Mi-Fi hotspots for smaller business meetings and for our leisure customers to use their devices. “Vodafone tailored our package to reflect the fact that, while we are fairly heavy users of data, our call usage is relatively light. By reflecting this mix, we are now saving around 15% on the cost of our previous arrangements. “When you get a combination of vast improvements in our operational capabilities and productivity, enhancements in the services we provide for our customers – and you make cost savings too, as a business that’s a very satisfying outcome,” concludes David.